We are offering Section Bending Machine to our clients. Himalaya, our Section Bending Machine is engineered to offer a variety of functions. It can cold bend and coil pipes, tubes and most other sections like 'l' beams, 'H' beams, unequal angles, channels, half pipes, flats, solid bars etc. In addition, the machine can help you make circular rings of any diameter from any of these sections with perfection. We are the leading organization in the market to offer the best quality range of Section Bending Machine. 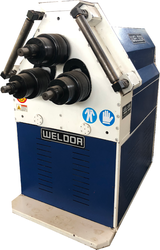 We offer a diversified gamut of quality approved Section Bending Machine that is suitable for bending different sections, bars, pad and pipes. This machine is made using high grade components, procured from reliable sources of the industry in compliance with international standards under the guidance of skilled professionals. High chrome tommy handle and screw. Easy rapirable & disamble all parts of machine. Rigid heavy fabricated base frame. Our organization is hailed in providing Section Bending Machine to our clients. This machine is recognized for its quality performance. 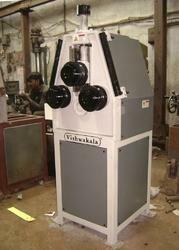 This machine is able to operate in reliable manner and is developed by experts by making use of quality material. This machine is available in different specifications. BA RL 300 is three roller pipe bending machine designed for highly precise tube/pipe, angle, i-section etc can be shaped to desire form with this machine. This machine is designed with adjustable working position(horizontal & vertical). As an illustrious corporation of the industry, we are eagerly immersed in presenting a broad gamut of Section Bending Machine to our patrons.